What is Sony and Aki-p up to now? Aki-p's yet another brilliant idea. Instead of handing the "rival" name to others, he'll just create a rival himself. I believe people won't be satisfied by 1 group monopolizing the whole industry therefore there will be some that will turn around and instead support a rival. By creating a rival himself, Aki-p can ensure that those people's money will still fall into his pocket at last. Majisuka Gakuen Summary Site - Summary with pictures for episodes of Majisuka Gakuen 2. Majisuka Gakuen 2 Casts - Complete translation from Majisuka Gakuen 2 Official Homepage. Nakayan Quest - Nakayan Quests in English! Starting from Lv. 18. The whole thing seems dumb to me. Soon every girl in tokyo will be in a idol group. Kind of waters things down imo. I'm not sure but I find it more to funny rather than brilliant... They're creating a 'rival' for their previous creations. Tokyo will be a town of idol then, won't that be great? Everyone you meet on the street is an idol. Hmm... is it rival or revival? Cover looks to me like orig set list album cover. Perhaps just some AKB48 thingy with new members (Team 4 or research students perhaps) singing the old songs from defstar era. Just my guess. In the picture an pink arrow points to Acchan... conspiracy!!! Some seem to be speculating that this is part of a deal for Akimoto to get the rights to the old Def Star era songs back. With the HKT auditions, new stages promised for all teams (including KII fingers crossed) and possibility of a Hokkaido based group and Taiwan seemingly put on hold, I hope Akimoto doesn't try to do too much and compromise the product. potential training ground for team 8? just a random thought, nothing more. Honestly I think there is nothing wrong with this. AKB48 is very sucessful but It is hard to belive that they won't last forever. (Even though i would be very sad. lol). It's time for new batch of girls to show what they got. For an example. Lady GAGA. There will probably someone bigger than her in the next few years. hmmm nobody can beat akb sales anymore. so they have to create their own rivals because they can't see anyone else as rival? Just as AKB is starting their 13th gen audition, serious heat in this rivalry... But if I were a Japanese girl looking for an idol career, I would rather go for AKB than Nogizaka... Afterall AKB is already well-established, but well, there will certainly be people who loves to challenge, let's see... Aki-P is planning to turn 1% of Japanese population into idol lol. I'm surprised that the Japanese aren't tired of the 48 family already, but you'd think this would take the cake. 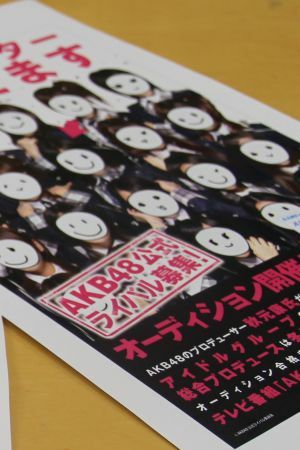 Seriously, another huge idol group, basically the same thing as AKB48 but a different name? I somehow think this will all backfire. I think this is a bad move. Just a feeling I have. I wouldnt enjoy watching them on tv if all they will talk about akb and them being rivals, unless there is trash talking. Wait, so Aki-p doesn't have the defstar rights? Does that mean everything from Team A's 1st, 2nd and 3rd stages? Because I LOVED those songs. 'Nageki no Figure' is INCREDIBLE. Is that why they never perform any old songs like Skirt, Hirari and stuff ?